Types of Wisconsin Car Accidents | Hupy and Abraham, S.C. There are many car accidents in Wisconsin every day. None of these accidents are the same. Injuries range from trivial scratches, to broken bones, to loss of limb, and even—in a significant minority of cases—death. There are many different circumstances and variables that make each accident unique. Although none of these accidents are the same, they can be categorized into different types. Thus, whether you’ve already been hurt in a crash, you’ve lost a loved one in an accident, or you want to be aware of the risks that you face on the road, it is important to learn about the different types of accidents that can occur on Wisconsin’s highways, rural roads, and urban streets. Rear-end wrecks. 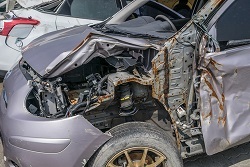 A rear impact accident occurs when one car hits the car in front of it from behind. This type of accident is usually caused due to the first car not braking in time to avoid the car in front. Rear impact collisions account for nearly 30 percent of car accidents in the United States. Head-on collisions. A head-on collision occurs when one vehicle hits the front of another vehicle. The most common cause for a head-on collision is a driver falling asleep. Other causes include distracted driving, drunk driving, and other forms of negligence. Collisions with pedestrians. When a car collides with a walker, jogger, or other pedestrian, the pedestrian is at a disadvantage. The pedestrian lacks the protective metal of the car, a seatbelt, and airbags and is often left significantly injured in a crash. Pedestrian accidents can occur in crosswalks, at intersections, in parking lots, and in other locations where pedestrians and cars share the road. Collisions with bicyclists. riders have every right to share local Wisconsin roads with motorists, and they often do. However, if the driver of a car is tired, drunk, distracted, or otherwise negligent, then a serious collision can occur and leave a rider with significant or fatal injuries. Rollover crashes. A rollover accident is when a vehicle flips onto its side or the roof. The most common cause for a rollover accident is a vehicle turning too sharply while at a high rate of speed. Tall vehicles are the most likely type of vehicle to roll over. If you have been injured or your loved one has died in any of the kinds of accidents described here, then it is important to know more about your legal rights and potential recovery. You may have the right to recover damages so that you do not suffer financially. To learn more about these rights, please read our FREE book, The Ultimate Guide for Automobile Accident Victims, and contact us directly via this website to schedule an absolutely free, no-obligation consultation.